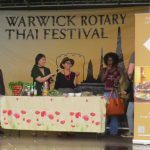 With many counter attractions to entice people to view on television at Wimbledon or Silverstone and other events taking place locally, the organisers of this weekend’s Thai festival in Warwick were disappointed at the low turnout as many local people chose other entertainment. Those who did attend were treated to a good show and were joined by Thai fans from as far away as Yorkshire and London to meet up with friends and family at this annual event. They enjoyed a packed programme of entertainment which started at noon with Monks performing a traditional welcome. 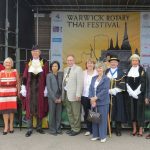 Then the President of Rotary John Hibben and Mayor Cllr Stephen Cross opened the festival explaining how the Rotary Club 13 years ago started it to raise funds for Thai orphans following the Tsunami in Thailand. 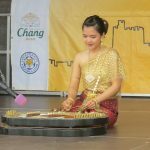 Families sat on the grass enjoying oriental food and beer from sponsors Chang whilst the show started with Traditional music, followed by a demonstration of Thai kick boxing from local gym Muay Thai. Throughout the afternoon there were a series of Thai dancing performances, Thai cookery demonstrations, and wine tasting whilst children enjoyed a play area and had their faces painted. The move to the Town’s racecourse has been controversial, but when a brief rainstorm came through people were able to shelter in the stands, use the bars, and carry on enjoying the atmosphere. Organiser Alan Bailey explained that the club has to finance the costs of the stage and programme’s entertainers, and charging an entry fee last year had allowed the event to raise £4,000 for charitable causes. 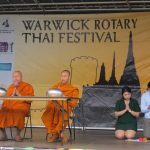 This year’s festival was sponsored by Warwick Castle, Kia cars, Costco, Tourist Authority of Thailand, and Chang Beer. Warwick Racecourse organised ticketing and opened its bars and facilities, with staff assisting organisers throughout the day, with CJ Events providing the stalls.